The main reason for our surprise visit to Buenos Aires was my mother in-law’s 75th birthday which we celebrated at the Park Hyatt’s Restaurant Duhau. 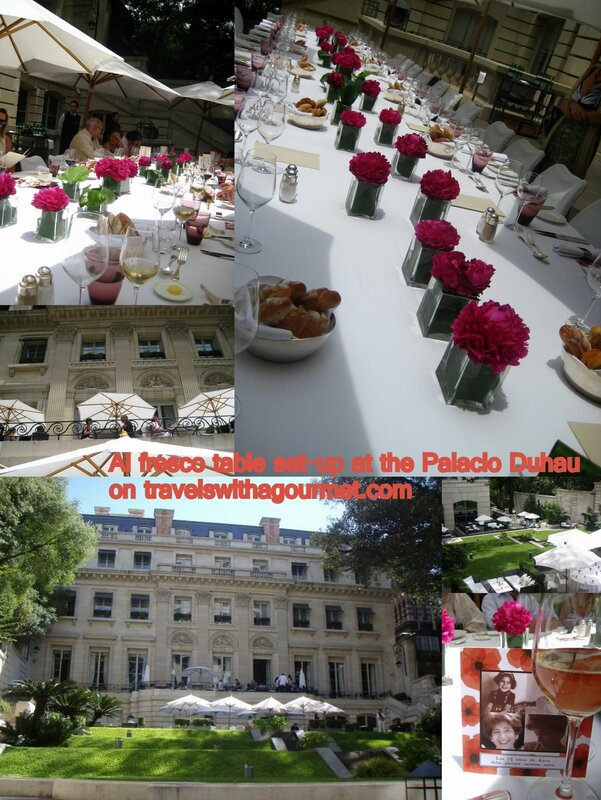 Family members and close friends were invited to an al fresco lunch starting off with some champagne and canapés at the Palacio Duhau’s aptly-named Crystal Room where impressive crystal chandeliers and candelabra complement the marble floors and high ceilings. Guests started trickling in at about half past twelve and were served chilled flutes of Chandon’s Baron B Brut Nature Millésimé along with delicious nibbles of mini scallops on skewers, leek quiches plus tomato chutney and thinly-sliced Camembert on crispy baguette. After about half an hour, we all went downstairs to the terrace of the Restaurant Duhau where we had asked them to set up one rectangular table underneath several large umbrellas to accommodate all twenty-seven of us. A linen napkin rolled in a silver ring embossed with a D was placed on top of a square card commemorating A‘s birthday with a collage of four photos. At each place setting were dark pink tumblers that matched the fuchsia peonies, her favorite flower, which were displayed down the middle of the extra-long table. The simple lunch offered a choice of a crisp salad of lettuce hearts, slivers of Grana Padano cheese and shallot vinaigrette or Eggs Benedict with smoked salmon for the first course. This was followed by either the Black Angus tenderloin with a sauce of Patagonian Morels or trout with sauce vierge (caper, lemon and olive oil) and wild arugula. Dessert was a trio of semi-dark chocolate parfait with slivers of candied orange peel, a dulce de leche frozen truffle and a tarte fine of Patagonian berries. 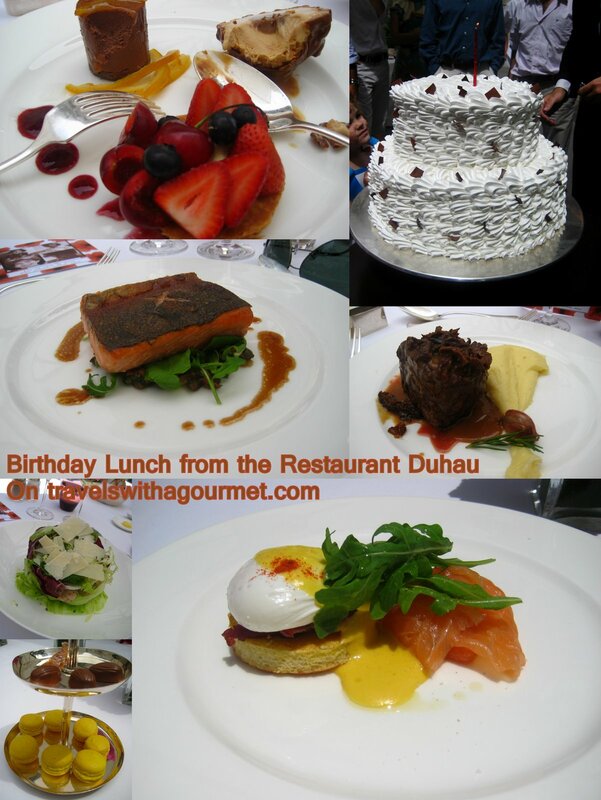 The food was delicious and beautifully presented – I had the eggs Benedict and the tenderloin while my husband had the salad and trout so luckily, I had a chance to taste all the food. Wines to accompany our meal were from Mendoza, Argentina’s famed wine region – a Terrazas Chardonay Reserva and Terrazas Cabernet Sauvignon Reserva. 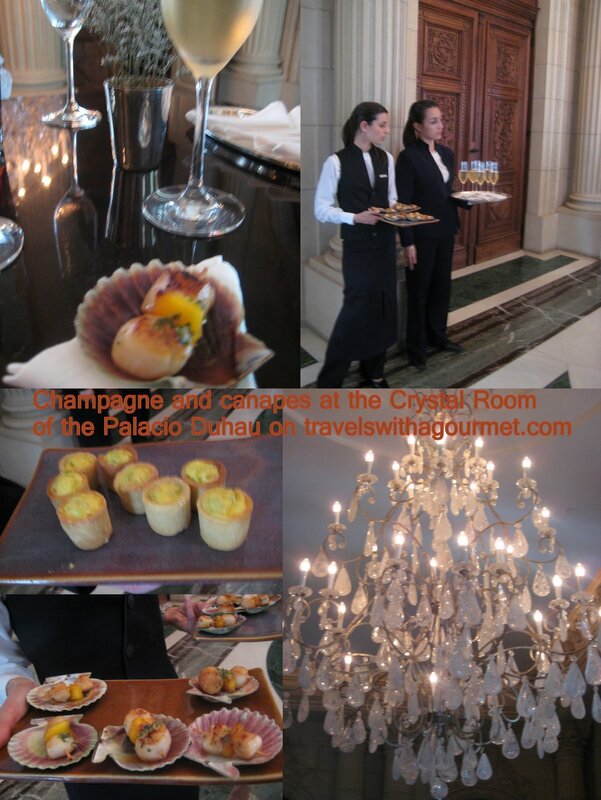 Service throughout was courteous and unobtrusive – glasses were refilled and plates cleared immediately. The younger guests had their own table set up on one of the sofas and they were served meat empanadas and chicken fingers with fries followed by three scoops of ice cream which they finished off quickly so they could spend the rest of the afternoon playing in the tiered gardens. After our leisurely lunch, Nespressos and petits fours were served then most guests exchanged places to sit around and chat with each other. Cigarettes were lit and conversations started on both ends of the table with family members and friends catching up on each other’s news and reminiscing about past birthdays. Soon after, the two-tiered birthday cake was wheeled out with the kids rushing over to help A blow out the candle while the rest of us gathered round to sing Happy Birthday. Endless photos were taken while slices of cake,either strawberry chiffon or chocolate-dulce de leche, were given out with more champagne and espressos. Despite the heat, everyone seemed to have had a good time and slowly, guests took their leave until finally there were only a handful of us left sitting in the shade, talking until it was our turn to go as well.